We had a warm, cozy fire over the weekend. Every time we have a fire in the fireplace, we always ask ourselves why we don't have them more often. For some reason, our fires are lit in the coldest months of winter. As I suggested to Mike, a summer fire...with the windows thrown open and the chirping of crickets outside...why haven't we done that? My hydrangeas are already budding, inspiring some spring reading (or at least the thought of spring reading)! I added an orchid to the mantle in anticipation of the changing seasons. Ever since the babies arrived, we've been spending most of our days in this room (which was tidied up before I took pictures!). For wear and tear (and spills and leaks), I typically throw a quilt over the couch. Baby swing is by Nature's Purest. I live in an island in the meditteranean sea so our winters are not eactly winters and we have loooon ghot summers! so we dont enjoy the fireplace very much!!! Your home is always so lovely. I agree: a fire in the summer is such luxury :). Why not? Summer fire...great idea! Your photographs are beautiful! Trina, so good to hear from you. The room looks lovely, so peaceful. Our hydrangeas are budding as well. And, some of the daffodils are already up! Can't wait. looks so bright eyed, that room and that fire. Beautiful photos... I think you have created a very lovely room for yourselves to enjoy life. I LOVE all the simple white, so heavenly! Wow, you really have it together. Twins and photo styling ,great pictures. Oh lovely. 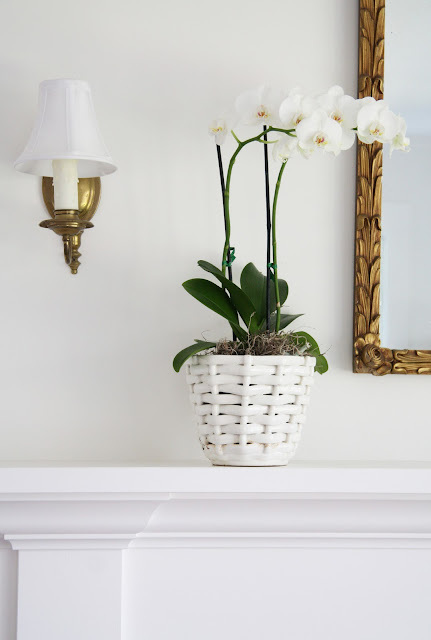 I'm always inspired by how gorgeously simple and fresh your home is. I love the white - it just looks so clean and bright. I am dreaming of spring also but yesterday was yet another winter storm with ice and 6 inches of snow and another storm scheduled for Friday...Oh please spring come soon. 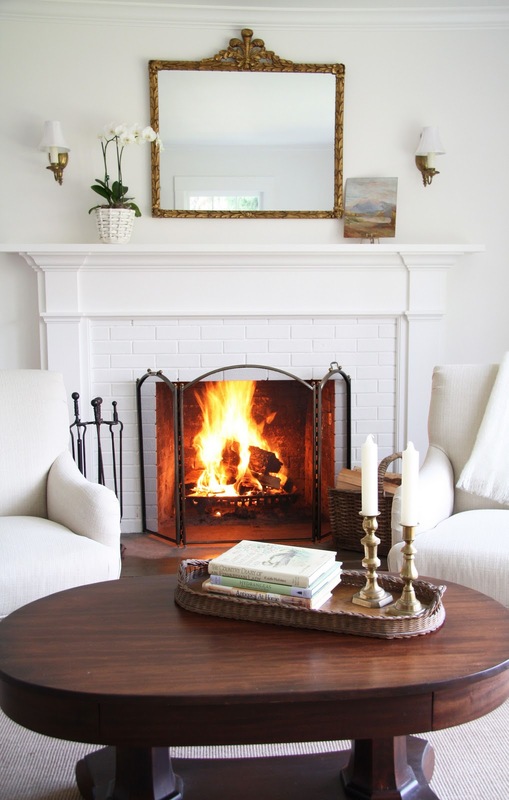 So classic...your fireplace is so inviting! you have two very lucky babes to grow up in such a warm & loving environment:). sending you wishes for a warm & cozy spring:). indoor summer fire- what a great idea;). will try it in a few months! A summer fire sounds wonderful, and the good thing about living in OR is that it's still cool at night well into the summer! I like that swing. Someone bought me the Fisher Price Little Lamb from BRU, and man, that footprint is HUGE! Thoughts of spring are swirling around inside my head dispite the freshly fallen 15 inches of snow we received over the weekend. Your house looks lovely. I always want to comment but think you have so many you probably don't have time to read them all. I too have thoughts of Spring. I am loving the room with all the sunlight. Such a light room...love the big windows, just right for surveying the view. 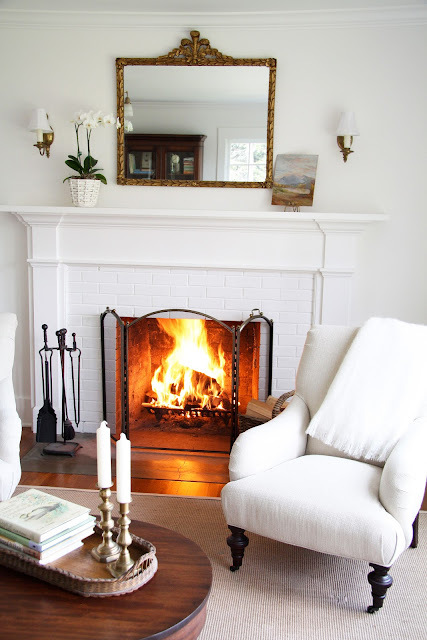 I love a roaring fire too...so comforting and cozy. Your room is so pretty and light too. I bet the babies enjoy looking out the window. 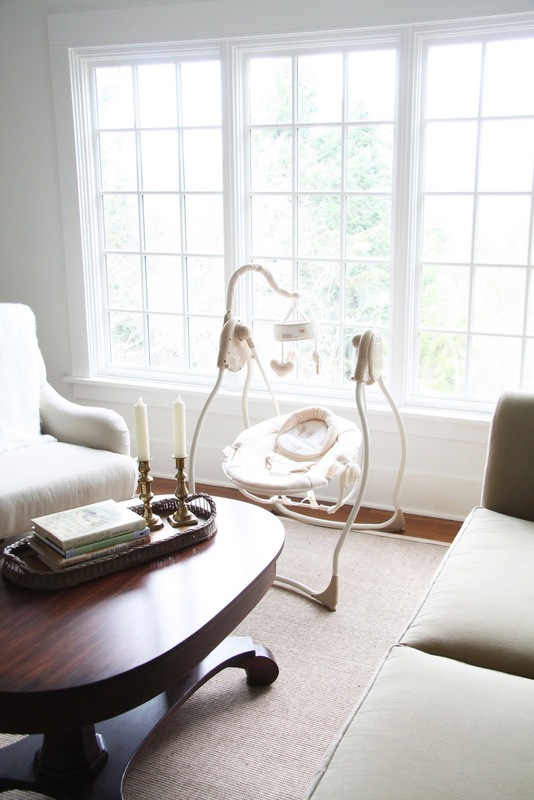 I put our baby swing in front of the window too. Its much more interesting than just watching me all day! Oh, and you're smart to put a quilt over your sofa. I've already had to wash spit up off of ours....not fun! Trina, those photos capture exactly the feel I want my home to have. I've kept them in my inspiration file. Your style is so simple and absolutely beautiful. I just posted on a winter snow storm putting the halt on my roses and shrubs that were just budding and to add insult to injury my orchids won't rebloom. Thanks for the loveliness of yours (orchid and photos) to keep me motivated! oh can just imagine how much you guys are going to have outdoors with two new bubs this spring! personally i'm aching for winter here, has been a long, very hot summer! I know it's been said before, but what I most admire about your blog is your clear sense of style, to which you remain true. You are not influenced by trends of the moment. It is refreshing. What a novel idea....a summer fire! I love a crackling fire so much why not extend it to all year long. what I wouldn't give for a fireplace...no such luck in Orlando, Fl. Hi Trina - What color and type of paint did you use in your living room/perhaps rest of the house? I love the white combined with antique wood tones. It's Simply White (EcoSpec line) by Benjamin Moore. It's in flat. The rest of the house is the same, although kitchen and bathroom are in eggshell. Counting the days, can't wait for the first signs of spring in my neck of the woods! As usual, your home looks beautiful. So nice to have found your blog. The photography and art direction are beautiful. I'll enjoy following. What a lovely fire! How nice for your babes to be able to swing away in such a beautiful light filled room with the fire crackling away. We've never had a fire in our fireplace, because we never got it inspected. The home inspector said that a separate chimney inspector would need to do that and we just never got it done. This is the year we'll finally schedule it and next winter we'll be enjoying the warmth of a fire, too. 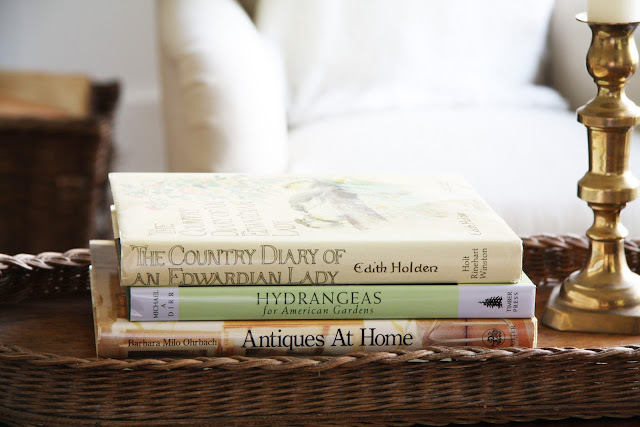 My favorite ways to spend my days are all right here at your farmhouse. Enjoying good simple healthy cooking, collecting natures sweet bounty, watching my husband be a good dad, a warm fire and snuggling with my children, 16 & 19. It's so nice to see your happy family is doing so well. congrats on your flea market style spotlight. fms got it right..."best original photos to drool over". your style and photos are so pure and simple. nothing like the sounds and smells of a fire indoors...we have been known to turn up the a/c and close all the windows and doors in mid august and have ourselves a great roar in the fireplace. Don't tell anyone, it will mar our tree hugger status! Love seeing the baby swing in front of the window, love your books...and love the orchid, it's beautiful...as white as *snow*! I love your blog, as evidenced by the fact that I am up reading it at midnight~ and am 25 weeks pregnant with twins, and dreaming of my house smelling like pumpkin walnut muffins! I have been reading your older posts and loved seeing the pictures of you pregnant through the months. My oh my, I fear the time is coming when I won't be able to get up the stairs or get these feet moving much at all! I'll be back to visit often and hear your tales of life with two (beautiful babies!!!!!!!!!!!). You have a lovely home and family~ congratulations!!! Beautiful fireplace, mantel and orchid. I would want to spend time there, too. Love the blog! We are just renovating an old house and mantles are on my mind! Yours is very nice and inviting! We have 4 fireplaces, 2 of which were covered up with faux paneling, and none of them have mantles. Lot's of work still to do, but looking forward! That setting looks ideal - no matter the time of year!! Hope those babies are sleeping well and smiling lots!! Beautiful! I am anxious for spring too! 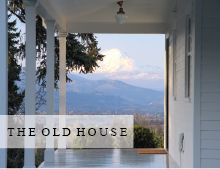 I am new to your blog and I had to tell you how much I love your house! It is beautiful! I will be back for sure to visit soon! Love the sunny room you share with your precious babies!! Just wanted to stop by again and see the prettiness. It's always such a pleasure to visit you all.